How Long Does Cooked Lobster Stay Fresh? 4 How Long Does Cooked Lobster Stay Fresh? When cooked to perfection, lobster meat is firm, yet tender, with a delicate, sweet taste that can not be replicated by other seafood. Leftover boiled lobster is just as delectable when reheated until just warm enough to meet safe handling standards. Whether reheated in a frying pan, oven or on the grill, lobster works well as an accompaniment to your favorite veggies or pasta, or all alone with just a pat of butter. Reheat boiled lobster to 165 degrees Fahrenheit. This temperature destroys dangerous bacteria that could otherwise lead to foodborne illness. Test the internal temperature by pressing a meat thermometer into the thickest part of the lobster after reheating. If the temperature on the meat thermometer registers below the recommended temperature, continue reheating until the temperature increases. Remove the boiled lobsters from the refrigerator and wrap in heavy-duty aluminum foil. Place the wrapped lobsters on a baking tray, belly up. Slide the baking tray into the oven and reheat for 5-10 minutes at 350 degrees Fahrenheit. A few pats of butter added to the foil packet will help keep the lobster moist. Check the temperature of the lobster by pressing the meat thermometer into the soft meat of the belly. The grill is another option for reheating whole lobster. Place the foil-wrapped lobsters right on the rack and grill over medium heat until done. Reheat boiled lobster meat, sans shell, in a frying pan with butter. Add the boiled lobster meat to a teaspoon of melted butter in a frying pan, and saute over medium heat. Check the temperature of the lobster meat after five minutes. Boiled lobster meat can also be steamed as a means of reheating. Boil an inch of water, then add the lobster to the pot. If you have a steamer basket or rack that fits the stock pot, place it in the pot and add the lobster meat to the basket or rack instead, for easier removal. The water level should barely touch the bottom of the rack or basket. 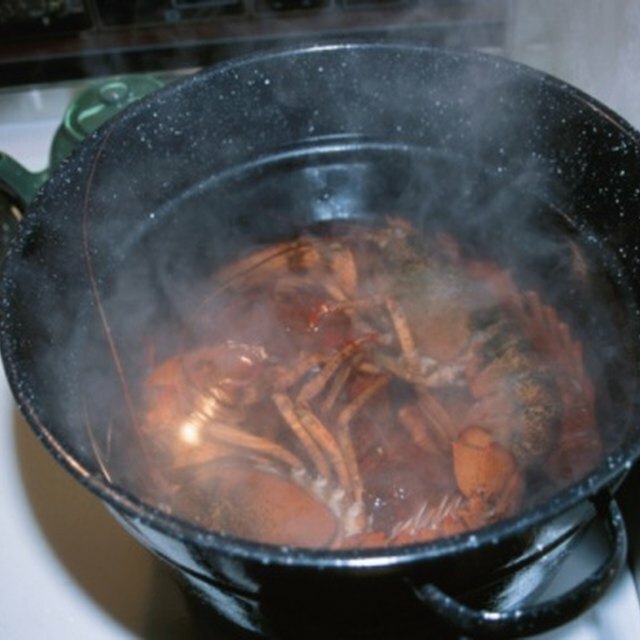 Place the lid on the pot and boil for five to ten minutes, depending on the size of the lobster pieces. Boiled lobster leftovers keep for up to four days in the refrigerator. Store these leftovers in an airtight container, heavy-duty foil or a plastic storage bag. If you do not reheat the lobster within the safe refrigeration period, discard. Freezing in plastic freezer bags or airtight containers keeps cooked lobster safe to eat indefinitely, but quality diminishes within four to six months of freezing. Google Books: What's a Cook to Do? Reference: How Do You Reheat Cooked Lobster?